Demonica is a new international thrash band formed by Mercyful Fate guitarist Hank Shermann. With every new thrash album that I hear these days I'm always filled with this dread that I'm going to start repeating myself throughout each and every review. This genre has been quite literally done to death and then resurrected in recent years with a torrent of new, young bands emulating their heroes from the eighties. So, with every new album you know that, generally, the metal is going to be solid thrash but nothing really new, with most of these bands 'standing on the soldiers of giants', so to speak. Some of these bands, such as Sweden's Decadence, try and give a new slant on the old genre with varying success but this is rare so in the majority of cases I generally just look for albums that make me jump out of my seat and start headbanging. Lately I've been inundated with these sort of albums! However, when a bunch of recognized and respected musician puts together a new thrash outfit that 'headbangable-ness' is not really enough and your expectation level increases. Such was the case when I got this album for review. That being said I loved this album from the opening chords! This is exactly the sort of thrash that I love. Heavy, gut-busting, neck-breaking thrash with top notch musicianship and a vocalist who sounds like his breakfast consists of several tons of grit and broken glass! Guitarist Craig Locicero (Forbidden) called the band's sound 'unmercyful thrash'* and it certainly is pretty relentless! Not to say that its just blistering speed throughout. There  are a fair few melodic sections throughout the album and one of my favorite tracks, My Tongue, is a mid-paced song with some great sing-along lyrics that really put a smile on my face. Well, you are allowed to smile during a thrash record you know. Ex-Battalion frontman Klaus Hansen provides the vocal assault on this record and, as mentioned, his voice is spot on. The words are intelligible throughout and delivered with real thrash attitude. Definitely, in my opinion, one of the best thrash vocal performances in recent times. The drumming and bass, provided by Forbidden and Heathen skin man Mark Hernandez and Corruption's Marc Grabowski respectively are both tight performances. Unfortunately the bass is, as usual, mostly lost in the mix. Shermann and Locicero both do a stirling job at hammering out both crushing riffs and excellent solos, both of which are a joy to listen to over and over again. Great guitar tone too, just what you want on a thrash album. Ok, maybe the songs aren't truly original, with riffs and structures you've heard before but, you know what? I do not care. I have so far listened to Demonstrous three times consecutively in just this sitting and every time it finishes all I want to do is listen to it again! If you want some quality thrash forget the latest Slayer and Megadeth albums and treat yourself to this instead! Demonica can almost be called an all-star project, coz on guitaris you have Hank Shermann (Mercyful Fate, Force Of Evil) and Craig Locicero (Forbidden) while Mark Hernandez is on drums (Forbidden, Heathen). Bassist Mark Grabowski and singer Klaus Hyr are nobodies to most metal fans, but this will change soon! Hank Shermann said about Demonica: "We are totally stoked how this turned out and can't wait to get it out there," says Hank. "These 10 songs are the most thrashy and brutal songs I have ever played." Demonica offer powerful, riff-based Bay Area thrash with an extremely fat sound. The album kicks off with the thrash grenates Demon Class and Ghost Hunt which show brutal riffs, fast drumming and pure aggression every trasher should dig. Both songs are kinda Slayer meets Exodus and Klaus Hyr sounds like Tom Araya / Rob Dukes. For My Tongue they slow down a bit and present a fat, heavy groove monster. Perfect neckbreaker! For Luscious Damned they speed up and the riffing shows similarities to Annihilator, even if the middle part offers some breaks and is a bit bulky. Below Zero is a complexly arranged homage to Pantera. Just the staccato-like chorus of Alien Six they offer another Slayer broadside while Palace Of Glass is another bow to Jeff Waters. A more modern tune is Summoned and for me it's the weakest track off Demonstrous. The closer is Astronomica, an instrumental which musicians will appreciate most, coz here everybody can show off his skills. Okay, there are similarities to some bands, but Demonica have their own identity due to the guitar play of Shermann and Locicero. Most songs at Demonstrous are on a high level, but not every one is totally convincing. 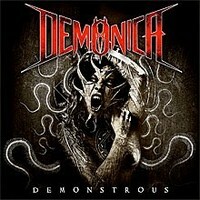 Anyway, a strong debut, so I can just recommend Demonica to thrash metal fans!